Nagoya (名古屋市, Nagoya-shi) is the fourth largest city in Japan and one of the country's leading industrial cities. Located on the Pacific coast in the Chūbu region on central Honshū, it is the capital of Aichi Prefecture Situated at the head of Ise Bay, it is one of Japan's major ports along with those of Tokyo, Osaka, Kobe, Yokohama, Chiba, and Hakata. 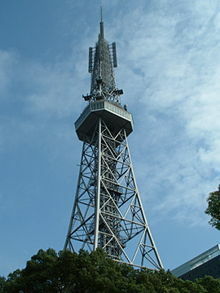 It is also the center of Japan's third largest metropolitan region, known as the Chūkyō Metropolitan Area (see also Chūkyō region). As of 2004, Chūkyō Metropolitan Area had nine million people and the city of Nagoya had an estimated population of 2,202,111. . The city of Nagoya was established in 1610 when Tokugawa Ieyasu moved the capital of Owari province there from Kiyosu, seven kilometers away. A new castle was built, and the entire population of 60,000 moved to the new location. After the Meiji Restoration in 1868, Nagoya continued to be a center for industrialization and economic growth, as sewing machines, time pieces and bicycles gave way to steel, automobiles and petrochemicals. Nagoya Castle, where the Tokugawa family lived for sixteen generations, is today a popular museum and tourist attraction. In 2005, the opening of the new Chūbu Centrair International Airport (NGO) in the city of Tokoname made Nagoya a major entry-point for Japan. In 1610, Tokugawa Ieyasu moved the capital of Owari province from Kiyosu to a more strategic location about seven kilometers away, in present-day Nagoya. 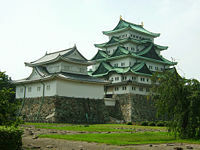 A large new castle, Nagoya Castle, was constructed, partly of materials taken from Kiyosu Castle. The entire population of the capital, around 60,000 people, and all the temples and shrines, moved from Kiyosu to the newly planned town around Nagoya Castle. 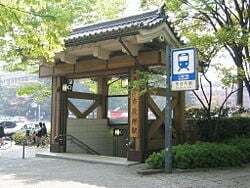 Around the same time, not far away, the ancient Atsuta Shrine was designated as a way-station called Miya (the Shrine) on the important Tōkaidō Road that linked the two capitals of Kyoto and Edo (now Tokyo). A town developed around the temple to support travelers, and the combination of these two castle and shrine towns forms what we now call Nagoya. Two (No. 40 and No. 41) of the 53 stops on the Tokaido Road, are located in Nagoya, depicted by the famous woodblock artist Hiroshige in The Fifty-three Stations of the Tōkaidō. Through the following years Nagoya became an industrial hub for the surrounding region. Its economic sphere included the famous pottery towns Tokoname, Tajimi and Seto, as well as Okazaki, one of the only places where gunpowder was produced under the shogunate. Other industries in the area included cotton and complex mechanical dolls called karakuri ningyo. During the modernization efforts of the Meiji Restoration, Japan's provinces were restructured into prefectures, and the government changed from rule by a family or clan to rule by government officials. 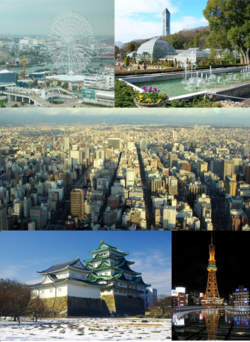 Nagoya was proclaimed a city on October 1, 1889, and officially designated a city on September 1, 1956 by government ordinance. The city's name was historically written with the same characters as the name of the older Emperor of that time (also read as Nagoya). The city was also historically known as "central capital" (中京, Chūkyō) because it was located between Kyoto, Shikoku and Tokyo. Nagoya's two most famous sightseeing spots are Nagoya Castle and Atsuta Shrine. Nagoya Castle was built in 1612. Although a large part of it burned down in the fires of World War II, the castle was restored in 1959, and some modern amenities such as elevators were added. The castle is famous for two magnificent Golden Orca (金の鯱, Kin no Shachihoko) on the roof, often used as the symbol of Nagoya. Atsuta Shrine is known as the second-most venerable shrine in Japan, after Ise Shrine. It enshrines the Kusanagi sword, one of the three imperial regalia of Japan. It holds approximately seventy festivals annually, and many people visit the shrine year-round. Also, the shrine has over 4,400 national treasures representing its two-thousand-year history. Midland Square, the new international sales headquarters for the Toyota Motor Corporation featuring Japan's highest open-air observation deck. Higashiyama Zoo and Botanical Gardens. The Toyota museums, The Toyota Automobile Museum in Nagakute and the Toyota Museum of Industry and Technology near Nagoya station. The Noritake factory (the home of Noritake fine chinaware) is also open to visitors and allows people to browse through the history of the establishment. Complete with cafe and information/technology displays, as well as shopping facilities. Visitors can spend a whole day wandering through the displays and grounds. It also holds a few sad reminders of devastation during the final stages of World War II. Nagoya is home to a robot museum. One of the earliest censuses, carried out in 1889, gave Nagoya's population as 157,496. It reached one million in 1934 and, as of 2004, the city had an estimated population of 2,202,111 with a density of 6,745 persons per km². There are estimated to be 945,328 households in the city—a significant increase from 153,370 in 1945 at the end of World War II. The total area of Nagoya is 326.45 km². 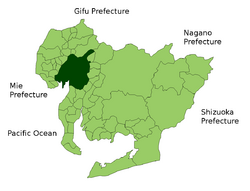 Its metropolitan area extends into Mie and Gifu prefectures, with a total population of about 9 million people, with only Osaka and Tokyo being larger. Entrace to Shiyakusho Subway Station. Nagoya is served by Chūbu Centrair International Airport (NGO) in the city of Tokoname and by Nagoya Airport (Komaki Airport) (NKM) which is located in the cities of Komaki and Kasugai. On February 17, 2005, all of Nagoya Airport's commercial flights (except for flights operated by J-Air) moved to Centrair. Nagoya Airport is now used as a general aviation and airbase facility. Several railways, including the high-speed Shinkansen (“New Trunk Line”) railway service running between Osaka and Tokyo, converge on Nagoya. Nagoya Station, the world's largest train station by floor area, is on the Tōkaidō Shinkansen, Tōkaidō Main Line, and Chūō Main Line, among others. The Nagoya Railroad and Kinki Nippon Electric Railway provide regional rail service to points in the Tōkai and Kansai regions. The city is also serviced by the Nagoya Subway. Through its port, Nagoya is linked to foreign ports, and to industrial areas by canals leading inland. 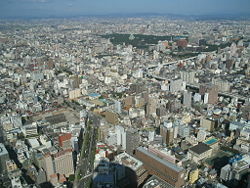 An aerial view of Nagoya. After the shogunate ended in with the Meiji Restoration (1868), Nagoya continued to be a major commercial center. The development of Nagoya's port, especially after World War II, and the city's central location and abundant hydroelectric power from the rivers of central Honshu stimulated the growth of heavy industry there. The traditional manufacturing of timepieces, bicycles, and sewing machines was followed by the production of special steels, chemicals, oil, and petrochemicals, as the area's automobile, aviation, and shipbuilding industries flourished. 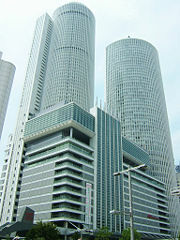 Nagoya's main industry is the automotive business. Many Japanese automotive companies are based in Nagoya. Toyota is headquartered in the nearby city of Toyota, and major automotive suppliers such as PPG also have a presence in Nagoya. The Japanese confectionery company Marukawa is headquartered in Nagoya, as is the fine ceramics company Noritake and Hoshizaki Electric Company, a manufacturer of commercial ice machines and refrigeration equipment. There is also a sizable aerospace and electronics industry in the area. Nagoya is also known as the birthplace of pachinko. Ibanez Guitars is based in Nagoya. The World Expo 2005, also known as Aichi Expo, was held from March 25 to September 25, 2005, just outside of Nagoya in the neighboring cities of Nagakute and Seto. JR Central Towers and Nagoya Station, the world's largest train station by floor area. Educational institutions in Nagoya include Nagoya University (1939), Nagoya Institute of Technology (1949), Nagoya City University (1950), and Nanzan University. Nagoya is home to the Nagoya/Boston Museum of Fine Arts, a sister museum to the Museum of Fine Arts, Boston, which was founded to bring aspects of the MFA's collection to Japan. The Tokugawa Art Museum is a private museum belonging to the Owari branch of the Tokugawa family who lived in Nagoya castle for sixteen generations. Among other historical artifacts, it contains ten designated national treasures of Japan. The Nagoya dialect is referred to as Nagoya-ben. Some famous Nagoya foods are misokatsu (pork cutlet with miso sauce); tebasaki (a type of yakitori); kishimen (flat udon noodles); misonikomi udon (noodles in thick miso soup); and Nagoya kōchin (a special breed of chicken). Nagoya is also home of the Shonai FC amateur football club and Nagoya Barbarians amateur rugby football club. Since 1984 the city has hosted the Nagoya Marathon; an annual marathon race for women over the classic distance of 42km and 195 meters. The Nagoya International Center promotes international exchange in the local community. The three great men who unified Japan in the sixteenth century all have strong ties to Nagoya. Oda Nobunaga (1534-1582) came from Kiyosu Castle in Owari Province, the western half of modern Aichi prefecture. With strong allies and effective generals he began a brutal process of conquest and unification, but died because of treachery before he could complete his task. After his death, Oda Nobunaga's town of Kiyosu was moved seven kilometers and became Nagoya. Toyotomi Hideyoshi (1536-1598) was one of Oda Nobunaga’s top generals. Born in Nakamura-ku, Nagoya (reputedly near the current Nagoya Station), he rose from the position of servant to become a general and then the successor to Oda Nobunaga after his death in 1582. Because of Hideyoshi's lowly birth, he was unable to get the emperor to pronounce him shogun; nevertheless by 1590 he had conquered Japan. Already in poor health, Hideyoshi instituted an invasion of Korea in 1591 and another failed invasion in 1597. He died in 1598. Tokugawa Ieyasu (1543-1616) was born in Mikawa Province, the eastern half of modern Aichi prefecture). An ally of Nobunaga, he was able to maintain a level of independence through Toyotomi Hideyoshi's rule. To maintain this independence, in 1590 Ieyasu made a bargain and relinquished his traditional home (which bordered on Hideyoshi’s) and moved himself and his army to Edo (now Tokyo). After Hideyoshi’s death, Japan split as different lords backed different contenders, but in 1600 after the decisive Battle of Sekigahara, Tokugawa Ieyasu was victorious. Later it was Tokugawa Ieyasu who decided to shift the town of Kiyosu and to build Nagoya castle. Sakichi Toyoda (1867-1930) was a prolific inventor from Shizuoka Prefecture. He established his loom business in Nagoya, where his sequence of inventions revolutionized the weaving business. In particular, he invented the G Type fully automatic loom, which stops itself when a problem occurs. In 2005 Forbes ranked Sakichi Toyoda as the 13th most influential businessman of all time. Kiichiro Toyoda (1894-1952), son of Sakichi Toyoda, established Toyota Motor Corporation in 1937, manufacturing trucks and what is considered the first fully Japanese manufactured production car, the Toyota AA. ↑ Nagoya's official English Name Retrieved May 21, 2012. ↑ 平成23年6月1日現在の世帯数と人口(全市・区別) (in Japanese). Retrieved 19 June 2011. ↑ Yamasa.org's Tokugawa Art Museum page. Retrieved November 6, 2007. ↑ Nagoya's Sister Cities. Retrieved 2007-04-20. Nagoya city the dynamic metropolis of central Japan. Nagoya, Japan: City of Nagoya. 1975. Nagoya-shi. The city of Nagoya. Nagoya: Secretarial Section, Nagoya City. 1957. Nagoya-shi Kotsūkyokyu. 1990. The Nagoya city bus and subway system. Nagoya, Japan: Nagoya Municipal Transportation Bureau. Najoyajō. 1900. Nagoya-shi, Japan. An art album of the Nagoya Castle the national treasure. s.l: s.n. Uchida, Hoshimi. 1987. Wall clocks of Nagoya, 1885-1925. History of the Japanese clock and watch industry, 2. [Tokyo? ]: Hattori Seiko Co. This page was last modified on 6 November 2018, at 00:30.